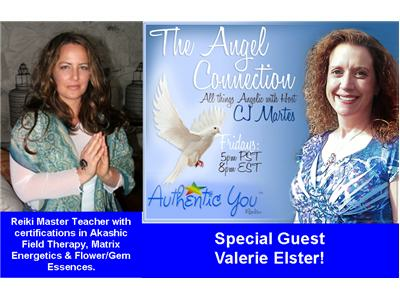 The Angel Connection with special guest Valerie Elster! This show focuses on current world shifts and how the angels are an integral part of the process. People all over are being asked to assist with the mission of the angels. Of course it’s an honor to be asked by the angels to help, but sometimes it’s not as easy as you’d think to take “orders from above”. Don’t forget about theAngel Message of the Week and Inspiring News at the start of the show. The last segment of the show is reserved first come, first serve basis for Angel Readings with CJ. If you’ve got angel or other spiritual questions, this is a show you won’t want to miss! Call toll-free during the show: 1-877-296-0345. Visit the official show page of The Angel Connection: www.AuthenticYouRadio.com/The-Angel-Connection.